Line large rimmed cookie sheet with waxed paper. In large resealable food-storage plastic bag, add 1 1/2 cups of the cookies. Seal bag; crush cookies with rolling pin, scraping cookies from inside of bag with spatula. In large bowl, add cereal. In medium microwavable bowl, microwave candy coating uncovered on High 1 to 2 minutes, stirring after 1 minute, until melted and smooth. Stir in 3/4 cup of the crushed cookies. Pour onto cereal; mix until coated well. Spread on cookie sheet, separating pieces slightly. Immediately sprinkle with remaining crushed cookies; refrigerate 15 to 20 minutes or until set. Carefully break cereal mixture into bite-size pieces. 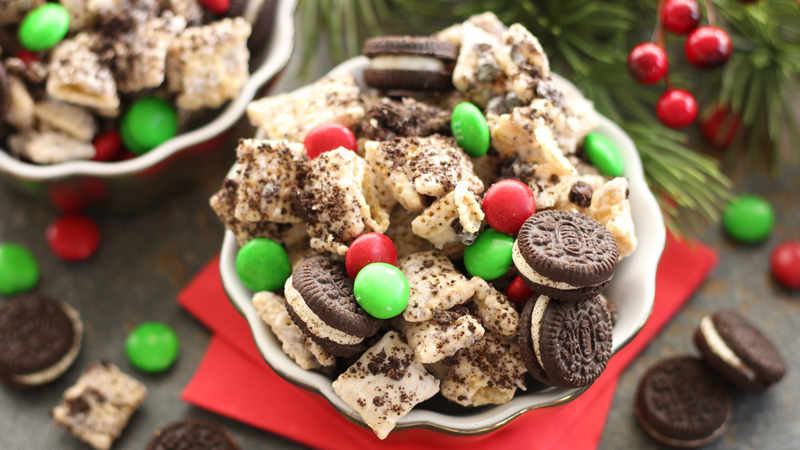 In large serving bowl, mix cereal pieces, chocolate candies and remaining whole cookies. Love more chocolate? Replace half of the Rice Chex™ with Chocolate Chex™ cereal. Store in covered container at room temperature up to 5 days.